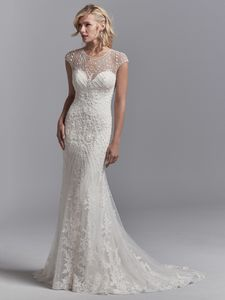 Description: This vintage-inspired wedding dress features a tulle overlay accented in geometric lace motifs with beading and pearls, creating an illusion jewel over sweetheart neckline, illusion cap-sleeves, and an illusion scoop back. Lined with Inessa Jersey for a luxe fit. Finished with pearl buttons and zipper closure.